Welcome to the new The Oban Times & West Highland Times web cart. Pay £45 for a 6 month subscription to The Oban Times & West Highland Times. Pay £68 by direct debit annually and never miss an issue of your magazine. Pay £75 for a 1 year subscription to The Oban Times & West Highland Times. 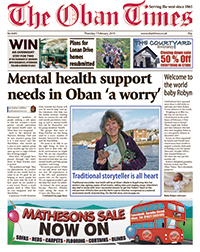 Pay £70 for a 6 month subscription to The Oban Times & West Highland Times. Pay £125 for a 1 year subscription to The Oban Times & West Highland Times. Warners Group Publications provide and support the payment platform for The Oban Times & West Highland Times.